edited by Noel Daniel, designed by Andy Disl. Taschen, 2014. It is December 13: St. Lucia Day. Our month is racing by, with little time to stop and reflect. Much of this is our own doing. Both girls are in The Nutcracker, and this is production week. It is also the last week of school for the year. Due to our state's ridiculous tax and budget issues, our school district chose to make the school days longer, start the year later, end the year earlier, and take longer breaks for Thanksgiving and Christmas. Big Sis's 5th grade show (performing arts magnet, remember) is also this Thursday, so I know she is exhausted. Money is short this year, and we decided to skip Lucia Fest in Lindsborg again. I did make Lucia buns this morning, though! And I have a book to share. A book-within-a-book, really. A Trip to Gingerbread Land by Einar Nerman, 1939. Last year, I posted about this beautiful book by Taschen that I got in Washington, DC. A Treasury of Wintertime Tales is full of gorgeously illustrated vintage books from international sources, bound in one handsome volume. 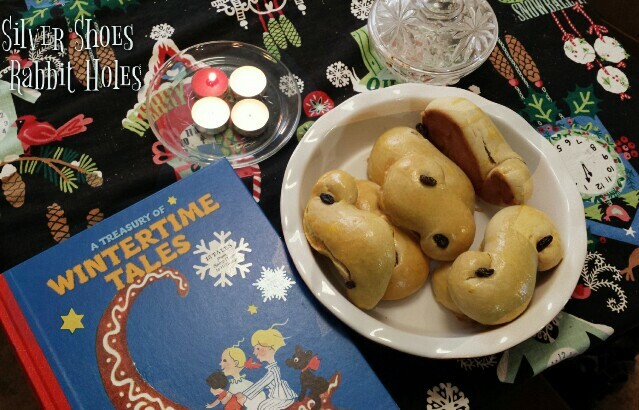 One story, A Trip to Gingerbread Land, takes place around St. Lucia Day. It is by Einar Nerman, a popular illustrator, author, and composer from Sweden. It was first published in the United States by Whitman in 1939. Liza and Peter are helping their mother make gingerbread cookies. It is the night before St. Lucia Day. Their mother leaves the kitchen, warning them not to eat the dough. Alas, the children fail to heed her warning, and after eating the dough, are sent to bed. That night, a gingerbread goat, much larger than the one they made that evening, appears. It takes the children on a magical flight to Gingerbread Land! They are greeted by a land where everything and everybody is made of gingerbread, even the animals in the zoo! What's more, everywhere they go they are given gingerbread to eat. The children are feeling pretty full, but it would be rude to refuse, right? Finally, the goat takes them to see the King of Gingerbread Land, who serves them a banquet dinner full of gingerbread. Every time they finish a bite, the servants bring more. The children try to tell them no more, but they are so full, they can hardly speak! At last, they come home. They are awakened from their fitful slumber by St. Lucia. She tries to serve them their gingerbread, and doesn't believe them when they tell her about their overnight journey. But there on the plate is the gingerbread goat, and Liza and Peter are certain they see it wink its raisin eye at them.